Pastor Shauna Ridge was appointed to lead Thorndale United Methodist Church on July 1, 2017. 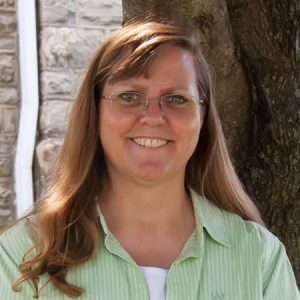 Pastor Shauna heard God’s call to church leadership while serving as the Director of Lay Ministries at Hopewell UMC in Downingtown. She completed her Master of Divinity degree from Wesley Theological Seminary in Washington, DC in May 2014. She also holds a B.A. in Dynamics of Human Performance Management from Immaculata University in Malvern, Pa.
Pastor Shauna’s most recent appointment was to Memorial UMC in Quarryville, PA. While at Memorial UMC, she led their leadership team to define their core values, clarify their vision and develop their strategic goals to guide the church’s mission and ministry. Pastor Shauna is strongly committed to doing ministry outside the walls of the church within the local communities she serves. In addition to local ministry, she has led and participated in several national mission trips to the Gulf Coast after Hurricane Katrina and has participated in several overseas mission trips to South Africa and Haiti. Pastor Shauna grew up in Phoenix, AZ and is married to her high school sweetheart, Jamie. They recently celebrated 30 years of marriage. They have two adult daughters, Jordan and Carly. This is a homecoming for them as they reside in the Downingtown area. Lawrence Rappoldt came to Thorndale UMC in December of 1978. At that time, he organized the church’s first handbell choir and served as organist for all the church’s worship services. Larry also accompanied the Chancel Choir on the organ or piano. The focus of Larry’s ministry is now on the 8:30 AM traditional worship service. He also is responsible for music ministry of the Chancel Choir and the Handbell Choirs and two years ago, resumed teaching Sunday School. When the need arises, Larry composes and arranges choral music for Chancel Choir. Beginning and ending his 32 year public school teaching career in the Coatesville Area School District of Coatesville, PA, Larry was the director of the high school orchestra and the award winning Red Raider Marching Band from 1978-1983. From 1983-2003, he conducted the distinguished Gordon Middle School Concert Band. Ensembles and bands under his tutelage were eleven times selected as among the best in the state. In 2003, Gordon Middle School closed and Mr. Rappoldt then provided leadership for the band program at Scott Middle School until the spring of 2010. In the fall of 2010, Larry started the band program at Conestoga Christian School in Morgantown and assumed the leadership of the band program at Berks Christian School in Birdsboro in 2011. Larry has guest conducted band festivals, written music for the University of Tennessee, and continues to compose and arrange music for instrumental and choral groups. Larry earned his Bachelor’s Degree in Music Education from Gettysburg College (Sunderman Conservatory of Music) where he studied piano with Dr. Michael Matsinko, organ with Dr. Dexter Weikel and voice with Dr. Finstad. Larry earned his Master’s Degree in Education from Wilkes University and has also studied at the West Chester University School of Music and St. Joseph’s University. Nancy Bell has been part of the TUMC community since 1976 and has served as the Church Administrator since 1978 under seven different pastors. No one knows the church like Nancy, and so if you need help with anything, she’s the person to look for.